It's no secret: Zaitunay Bay is not thriving in the manner its creators had envisioned. The original 17 dining establishments are down to 15: Zabad and Salmontini Riva closed their doors a few months ago and are already making way for new venues (Boubess' Pizzeria Pomodoro is one). The sad reality is that renting one of these outlets is as expensive as $500,000 per year, which translates to $42,000 per month, and many restaurants are not turning over this kind of revenue. Tourism in Lebanon has severely stagnated, and it's nowhere more evident than in Zaitunay Bay, as a midday or evening stroll on any weekday proves: there is hardly anyone. Perhaps Paul, Cappuccino, and Classic Burger Joint draw out the largest crowds, as they are casual eateries and their pricing schemes are standard across all branches. But the others, nearly all references in fine dining, are struggling. I don't understand the quinoa hype currently sweeping through Lebanon. 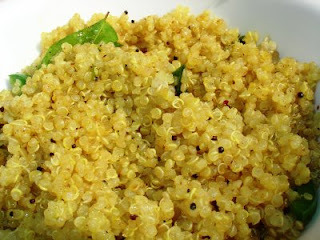 Quinoa (pronounced "keen-wah") is a seed grown in the Andes Mountains of South America. It has been touted for its superfood powers: its protein content is relatively high but not nearly as much as in beans and legumes; it is a good source of dietary fiber and phosphorous; and it is rich in magnesium and iron. Vegans adore it because it is gluten-free. Lactose-intolerant folk cherish its calcium content. Lebanese like it because, well, it's popular in the West. You sold? I certainly am not. And yet it's served everywhere. Casper & Gambini's features a light salad called "Lemon Quinoa." Bhar offers it as an ingredient in their salad bar--it was the first (and only) time I tried it, but I confess, I wasn't quite sure whether to use it as a base or topping for my salad, given its tiny and delicate nature. 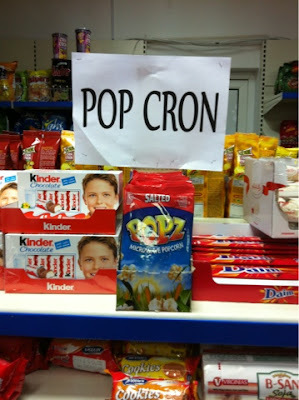 Funny how the only item requiring a sign in this quick mart is the popcorn, and even then, its spelling was a challenge. So why exactly are they looking to hire?